Under different periods of history, Arakan had been an independent and sovereign monarchy ruled by Hindus, Buddhists and Muslims. According to A. P Phayer and G.E. Harvey, the Arakanese kings established alternately capitals in eight different towns, transferring from one to another. Rohang, the old name of Arakan, was very familiar region for the Arab seafarers even during the pre-Islamic days. Tides of people like the Arabs, Moors, Turks, Pathans, Moghuls, Central Asians, Bengalees came mostly as traders, warriors, preachers and captives overland or through the sea route. Many settled in Arakan, and mixing with the local people, developed the present stock of people known as ethinc Rohingya. The Rohingya have been leaving their home country for 30 some years now. They have been described as some of the world's most persecuted refugees, and among the most forgotten, too.. They have gone to many different countries, but the biggest choice for them is Bangladesh. There, the Rohingya experience even more difficulty, as the Rohingya are severely poor and have little rights given to them as refugees. The Bangladeshi government has never formally given them refugee status, and have forced many of them out of the country. Around 230,000 of the refugees have been repatriated to Burma, but approximately 20,000 remain in the UNHCR administered camps. At least 100,000 Rohingy are believed to be in Bangladesh out side the camps and with no official status as refugees (MSF-Holland). In the most southern part of Bangladesh, near the city of Teknaf, live 6,000 Rohingya refugees from neighboring Myanmar (Burma). They live in terrible conditions in a provisional camp. Classified by the Bangladesh government as illegal immigrants, the people have not received any support until very recently. Since the end of May, Médecins Sans Frontières (MSF) has been operating a small healthcare centre and improving the water supply and sanitary conditions in the camp. The Rohingyas are a Muslim minority that are deprived of citizenship rights in their native country of Myanmar and are subjected to various forms of repression by the government there. Many camp residents, like this old woman, fled to Bangladesh years ago. Some were sent back to Myanmar. “I was born in Myanmar, but the Burmese government says I don’t belong there. I grew up in Bangladesh, but the Bangladeshi government says I cannot stay there. As a Rohingya, I feel I am caught between a crocodile and a snake”. Told a 19-year-old refugee in Bangladesh. “If I go to get wood, I’ll get arrested. If I collect water I’ll get beaten. If we move our houses, we’ve got nowhere to go.” said one woman living in Kutupalang camp( MSF report). "Without a fundamental solution for the Rohingya not only in countries where they seek asylum but at their origin, there is no apparent end to this humanitarian crisis,"
RohingThe Rohingya people of Burma an ethnic group existing in a state of national Limbo, are one of the most severely affected communities living under the military regime in a country where human rights abuse and suffering is the norm. The systematic human rights abuses towards the Rohingya are committed with intent to destroy this particular minority community. The Rohingya living in the north of Rakhine State of Myanmar are legally obliged to purchase expensive marriage permits, unlike the rest of the population. Children being born out of marriage often results in high informal fines or imprisonment and a two child only policy applies. Since 1948 about 1.5 million Rohingya people have either been expelled or have had to flee the country to escape persecution. Most of them are found in Bangladesh, Pakistan, KSA, UAE and Malaysia. They are vulnerable without any status in those countries. Neither civil society Organizations nor UN bodies and other international Organizations properly addressed this issue since last two decades. Prime minister U Nu declared “Rohingya” as an indigenous ethnic group of Burma like the Shan, Kachin, Karen,Chin,Mon and Rakhine in a radio speech broadcasted at 8.00 p.m on 24th September,1954. But aftermath down fall of U Nu government the state peace and development council (SPDC, Burma`s government) rejects the existence of a separate ethnic group called “Rohingya”. They are not considered to be a national ethnic group as provided by sec.3 of the 1982 Law, and members of the Rohingya population are therefore ineligible for full citizenship. The military regime has declared the Rohingyas as non-nationals in utter disregard of their history, glorious past and establishment in the country.Planned increase in Buddhist settlement has caused serious demographic changes in northern Rakhine(Arakan). The Rohingyas have to provide slave Labor to build military establishments, bridges, embankments and pagodas. Since the promulgation of of Burma citizenship Law in 1982, Rohingya students have been denied the right to education. Around 230,000 of the refugees have been repatriated to Burma.Some of these people have returned after being repatriated and other new people continue to arrive. Approximately 20,000 remain in the UNHCR administered camps. 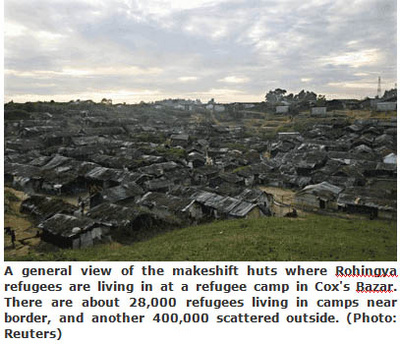 At least 100,000 Rohingy are believed to be in Bangladesh out side the camps and with no official status as refugees. Although the Rohingya issue belongs to Burma, but it affects Bangladesh the most because of its closed border with Burma. Bangladesh government has failed to raise the issue in international level..The bilateral relationship between Bangladesh and Burma is obsessed with its economic prospects, the government successfully down played the problem as a repatriation matter only that overshadowed the Rohingya issue. A durable and dignified solution for the Rohingya must be found, not only in countries where they seek asylum, but at their origin in Myanmar. The New Nation, DHAKA, December 31,2009 : -Bangladesh’s plans to repatriate 9,000 Myanmar Muslim refugees to their homeland hit trouble yesterday when a leader of the minority said they would refuse to leave. Bangladesh’s top foreign ministry official, Mirajul Quayes, said Tuesday that neighboring Myanmar had agreed to take back 9,000 Rohingya refugees in what was seen as a breakthrough in a decade-long problem. Quayes, the foreign secretary, said during talks with Myanmar deputy foreign minister Maung Myint in Dhaka that the military regime had agreed to accept nearly one-third of the officially recognised refugees now in Bangladesh. Jalal Uddin, who is the secretary of the UN-recognised Kutupalong camp, said Rohingya refugees "are always ready to go back home" but stressed that rights as Myanmar citizens could not be guaranteed. "(But) we don’t have any rights in Myanmar," he told the news agency by phone. "If we go back, the armed forces will use us as bonded labour. "Many will be sent to jail. There are still curbs on practising our religion or movement from one place to another without the army’s permission." Described by the United Nations as one of the most persecuted minorities, some 250,000 Rohingyas fled to Bangladesh in the early 1990s. But some 230,000 were later taken back by Myanmar following a UN-brokered deal. Since then, thousands of Rohingyas from Buddhist-majority Myanmar’s northern Rakhaine state have streamed across the border every year and are now estimated to number nearly 400,000. But only 28,000 of them have been granted official refugee status and are allowed to stay in two UN-assisted camps in the country’s Cox’s Bazar district just miles (kilometres) across the Myanmar border. "Some 9,000 are ready to be repatriated following verification, as the Myanmar government has assured us today that they are also ready. And it can begin within the shortest possible time," Quayes said Tuesday. Bangladesh’s Foreign Minister Dipu Moni last August said the undocumented refugees put a "heavy burden" on Dhaka, causing major social, economic problems. Quayes expressed his concern about the increased influx of Rohingyas in recent months and urged Myanmar to take them back. "We’ve pressed the Myanmar government to take steps to get them back," he said. Conclusion: Refugee influx in to Bangladesh from Burma is not a new. Rather it is a regular complexity for Bangladesh for why a permanent solution to the Rushing issue is essential . The Myanmarese military government is being tried to marginalize and eliminate the ethnic Rohingy Muslims by imposing various restrictions that make them difficult to survive on their native soil, Arakan for why they are compelled to leave their ancestral land in search of better livelihood and political solution. So, repatriation of Rohingya refugees without guarantee for their citizenship must not helpful for stopping fresh refugee influx in to Bangladesh. Rather the refugees expressed their reluctance to return until their indigenous issue is not solved. However, Interfering to this issue by International communities including Bangladesh is most crucial and inevitable. Otherwise, the neighboring countries particularly Bangladesh will not be relaxed from the tension of refugee influx.